In July 2017, we're putting some of our treasures on display as part of a celebration of the 50th Anniversary of the Faculty of Mathematics. Panels from the IBM 1620 and IBM System/360 Model 75--two critical computers from the 1960s. SuperPET and a SuperPET emulator, so you can go back to the early 1980s and learn to program BASIC, FORTRAN, APL, COBOL, or Pascal. Normal visiting hours are 10am to noon, but contact us at computer.museum@uwaterloo.ca to arrange a tour. If you have any donations, feel free to drop them off as well or get in touch. We'll upload some photos as the exhibit unfolds! 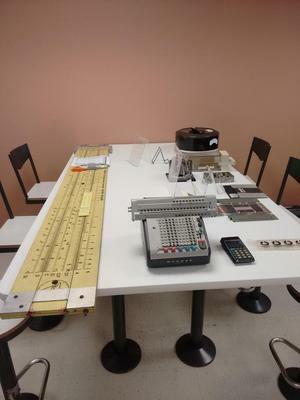 The giant slide rule, calculators, and various storage media.